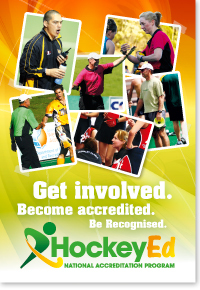 Hockey Australia would like to welcome you to the national coach, umpire, and technical accreditation training programs, collectively known as HockeyEd. The HockeyEd umpire and coach training programs are competency based and are designed to reflect the modern game and the needs of hockey participants. These focus of these programs is developing practical skills and self-development, and thus ensure coaches, umpires, and technical officials are better prepared to meet the demands of the game. The HockeyEd accreditation programs are open to those candidates who can be assessed within the Australian hockey environment. The programs are delivered in a combination of formats including online learning, practical sessions, self-development activities and workshop training. Welcome to the new HockeyEd site. If it's your first time here, visit the FAQ to find out how to sign up and enrol for courses. Hockey Australia would like to welcome you to the national coach and umpire accreditation training programs, collectively known as HockeyEd.